electrically [DCF (RS232)synchronisation and 1PPS (RS485) frequency standard]. Device synchronisation precision over ethernet network is +/-1ms. UTXvTS can be used simultaneously: for UTX series devices synchronisation over ethernet and for ARCHI 9000 fault recorder system synchronisation. 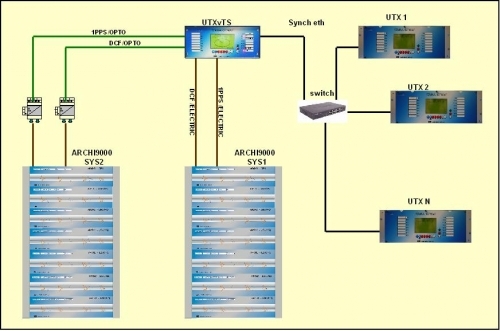 Registration synchronisation error within ARCHI 9000 system with UTXvTS use is <25us.